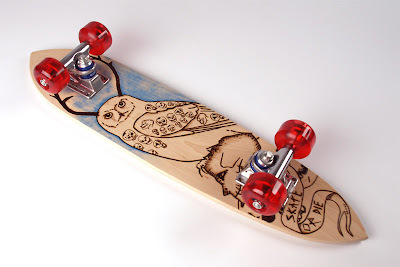 Poppytalk Handmade participant, Valerie Thai of Cabin + Cub along with her husband, Roger Allen of Crooked Walker have collaborated together (under Crooked Walker) to create a one-off skateboard as part of the Smile On Your Brother art show. A selection of artists and designers were asked to create art boards. All the boards will be auctioned online (Aug 24th - Oct. 25th) to help raise funds towards donating 100 skateboards to disadvantaged youth across Canada. They chose to woodburn theirs (love) and here is a link to the other boards in the auction. The boards will be in a traveling exhibit across Canada, and will be displayed at Livestock in Vancouver on August 24th - 26th. It will carry on to Calgary, Saskatchewan, Toronto, Montreal and Quebec City.